Ohhhhhhhhhhhhhhhhh…everytime I see another picture of Linus I cry…..
Awwww, poor little man. When Scarlett was about a year, she had an allergic reaction to Penicillin and woke up with a horrific rash that migrated, so everyday we had no idea how it would look and where it would be. It took a few days for the meds to kick in and a good long while (it seemed at the time) to disappear. It was so scary!! Here’s hoping Linus gets well before Christmas. If I don’t talk to you before then, have a GREAT, happy holiday. From one triplet mom to another – hugs hugs hugs! thanks, mama. 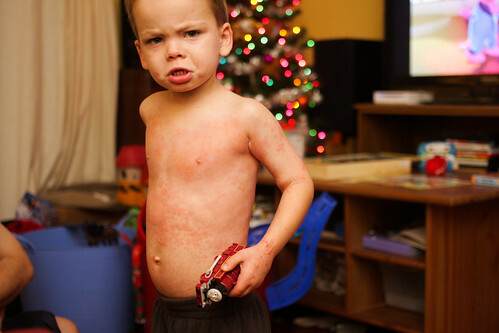 linus had that rash like scarlett too, when he was 9 months. but at least that didn’t bother him too much. i think he’s definitely getting better, so thanks for the well wishes. Poor little bug!! Hope he feels much better soon – before Santa comes!